With a library of 18 wildly varying typefaces, it’s hard to believe that Albatross started out as a “self-training exercise” for Oklahoma-based designer Jay Hilgert. Following several years spent working as a graphic and web designer, Jay launched his foundry in 2008 with his debut typeface Tire Shop. Since then, the designer has continued to hone his natural gift for crafting beautiful display faces. One of his most recent fonts, Microbrew, is proof of the foundry’s expertise in this genre of type. Featured in our May 2014 edition of Rising Stars, the foundry’s most popular font to date has reigned over the Hot New Fonts list and even made it into the top 5 of our Best Sellers list after it’s release. 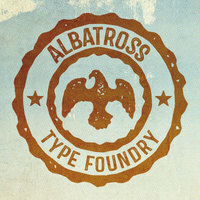 Drawing inspiration from his hometown, the designer says that a handful of Albatross fonts are based on “found” type in and around Oklahoma City. He loves to experiment with different hand-drawn production techniques and to incorporate symbols into his typefaces.